With rich industry experience, we are betrothed in offering Digital Multipara Monitor. 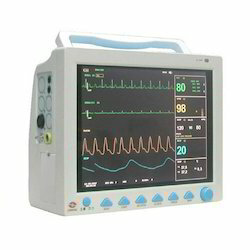 The given monitor is efficient in performance and extensive use in report respiration. This monitor is developed using high quality material & leading techniques in accordance with industry standard. In addition, the monitor offered by us is passed through a series of practical tests so as to supply a defect free range. Looking for Digital Multipara Monitor ?